Celebrity Culture and the American Dream, Second Edition considers how major economic and historical factors shaped the nature of celebrity culture as we know it today, retaining the first edition’s examples from the first celebrity fan magazines of 1911 to the present and expanding to include updated examples and additional discussion on the role of the internet and social media in today’s celebrity culture. Equally important, the book explains how and why the story of Hollywood celebrities matters, sociologically speaking, to an understanding of American society, to the changing nature of the American Dream, and to the relation between class and culture. This book is an ideal addition to courses on inequalities, celebrity culture, media, and cultural studies. Students will find this book (infused with history, sociology, communication, as well as gender and cultural studies methods) both accessible and engaging. 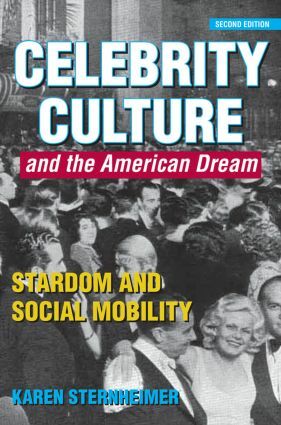 Sternheimer’s descriptions and arguments lend themselves to lively discussion about the evolution of celebrity and what that meant then and now for American society more broadly. The new edition of Karen Sternheimer's groundbreaking text could not arrive at a more opportune time. As outrage over economic inequality in the wake of the global credit crisis is reaching a fever pitch, Celebrity Culture and the American Dream makes an invaluable contribution to the critical debate. This deftly written book is certain to have an enduring impact across a wide-range of academic disciplines and fields. By demonstrating the ways in which social changes are ideologically represented in ads and popular culture magazines, Sternheimer demystifies the workings of what has become a central institution in contemporary American society. This is a must read for serious scholars of celebrity culture, yes accessible for readers at all levels. Karen Sternheimer offers an engaging social history addressing the intersectional relationship between stardom, social mobility, gender and consumerism. It will be essential reading for anyone interested in understanding the American fascination with celebrity. She describes how spectators collude with fantasies of fame and fortune, to play an active role in spreading celebrity culture and its uniquely gendered myths. Karen Sternheimer's adept sociology of celebrity makes critically important issues lucid for a wide readership. With its broad historical scope and up to the minute examples, this is an excellent classroom resource. Karen Sternheimer is a sociologist at the University of Southern California, where she is a distinguished fellow at the USC Center for Excellence in Teaching. She is also the author of Connecting Popular Culture and Social Problems: Why Media is not the Answer (2013), Celebrity Culture and the American Dream: Stardom and Social Mobility (2011), Kids These Days: Facts and Fictions About Today's Youth (2006), It's Not the Media: The Truth About Pop Culture's Influence on Children (2003), and is the editor and lead writer for everydaysociologyblog.com. She has provided commentary for NPR, CNN, MSNBC, The History Channel, and Fox News.